Many of you ask what it takes for the Health District to shut a restaurant down for good. In tonight's Dirty Dining, Darcy Spears shows us how that almost happened, and how the restaurant in question earned one last chance to change its ways. LAS VEGAS (KTNV) — Many of you ask what it takes for the Health District to shut a restaurant down for good. In tonight's Dirty Dining, Darcy Spears shows us how that almost happened, and how the restaurant in question earned one last chance to change its ways. Pad Thai on Rancho near Charleston is a Dirty Dining repeat offender. But it's their repeat offenses with the Health District that have put their license on the line. When we went there on Monday, we found two signs on the window and door. One said "Closed for training" and another said "Closed for renovation." But the true story was on the sign taped to the inside of the door behind tinted glass. That Health District's closure sign was not the usual pink. It was green, indicating there was something different going on at Pad Thai. That sign said the restaurant was closed--its permit suspended pending revocation due to an ongoing pattern of non-compliance with basic food safety as well as Health District regulations. 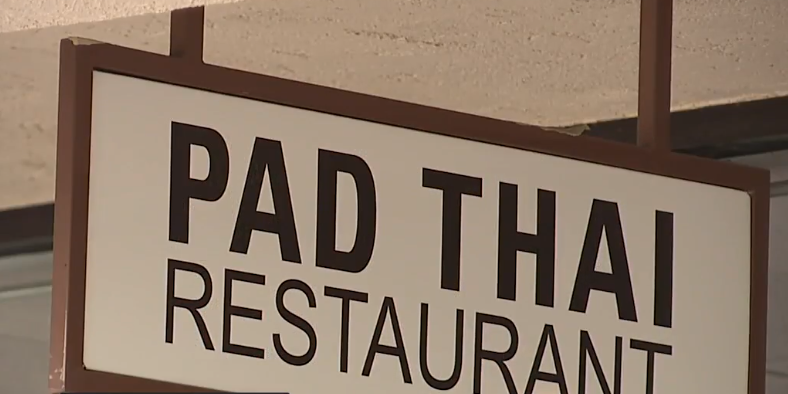 Health District records show Pad Thai is facing permanent closure for continually jeopardizing public health. The restaurant has a history of critical and major food safety violations going back to May of 2012. They were warned last summer that one more downgrade in the next year would result in immediate closure and a suspended permit. And that happened on March 26 when they got a 31-demerit C grade. There were multiple handwashing violations including some involving raw eggs. Cut leafy greens, chopped garlic in oil, cooked chicken, noodles, tofu, bean sprouts, cut tomatoes, cooked pork and deep fried chicken were all deep in the temperature danger zone. The food had all been sitting out for at least four hours before the inspection. There were also utensils in lukewarm standing water; a repeat violation for double-stacking food containers without barriers; excessive slime in the ice machine; excessive food debris on utensils and excessive grease and dirt throughout the facility, especially at the wok station. Other food violations included expired cheese, soda syrups that had expired as far back as December but were still in use and uncovered food in the fridge that was subject to cross contamination. The restaurant's doors were locked on Monday, but we knocked and called to a woman inside. She saw us, sat down in a booth and watched us talk to her through the door, but just walked back into the kitchen without responding. Pad Thai's voicemail message said they were closed to remodel the kitchen. We left a message but no one called back, so we returned one more time to try again. That time, the restaurant was open. When we arrived, a man who refused to identify himself came out from the kitchen, declined to answer any questions and asked us to leave. We learned that at a hearing on Monday, Pad Thai signed a last-chance agreement with the Health District. It comes with strict conditions that last for the next year and a half. They were allowed to re-open but in order to stay that way, they have to do a deep cleaning once a month, replace old equipment and have a food safety consultant with the power to fire employees come in twice a week. They must conduct a daily opening checklist and keep daily refrigeration logs, have a certified food protection manager on duty at all times and undergo increased unannounced inspections with no downgrades. In addition, if the business is sold, the owner must relinquish it entirely and have no involvement with the facility whatsoever. We also have two restaurants that tied for the highest demerits--Sea Salt Oyster Bar and La Fonda Mexican restaurant. Sea Salt Oyster Bar's sushi/oyster bar on Bermuda and Silverado Ranch got a 35-demerit C grade on March 28. Violations included improper handwashing and oysters and fish improperly stored in igloo-type coolers in bags without required tags. Because the facility was unable to produce tags, the food was placed on hold for investigation. Food at unsafe temperatures included shrimp tempura, softshell crab tempura and softshell mix. The faucet was severely leaking, cloth towels were used to cover sushi rice, the scoop handle was touching minced garlic and bowls were being used as scoops. The ice cream scoop was stored in standing water, food was stored under the paper towel dispenser and an employee's personal vape was stored with clean dishes. There was no sanitizer available and the inspector had to ask them two separate times to provide it. The sushi chef was unable to answer food safety questions and the restaurant manager wasn't there and had to be called in. That resulted in a violation for not having a designated person in charge on the premises. Inspectors found the sushi mixing bowl warped and chipping inside and pooling water on the floor under the oyster display. They still have a C grade but the manager told us everything is fixed now and they're awaiting reinspection next week. He said they're trying to do their best as a new concept restaurant under new management. The other 35-demerit C grade came on March 26 at La Fonda Mexican restaurant in Overton where inspectors watched a food handler use bare hands on ready-to-eat tortilla chips. An employee wore the same gloves to handle raw chicken, then touched plates, the bean scoop and ready-to-eat cheese. There were no shellfish tags for oysters or clams, chicken was not cooked to a high enough temperature and beans and red sauce found at unsafe temperatures had to be thrown out. A dirty knife was stored as clean and there was excessive food debris on multiple utensils stored in dirty conditions. Lots of ants infested the kitchen under the chip warmer, dining on chip crumbs. Avocados were not washed, lemonade syrup was expired, the over was dirty and there was pink mold in the ice machine. We reached La Fonda's owner who said she was too busy comment and although we left a phone number for her to call back at a more convenient time, she never did. According to the Health District's website, La Fonda still has a C grade.